I think I have an obsession with butternut squash soup. Adding a little curry puts this delicious heart warming Autumn harvest soup over the top. It's just so delicious, it's hard to believe there isn't any butter, sugar, cream, honey or fruit in this recipe. It's just pure satisfying deliciousness that's good for you too. I usually double the recipe because it doesn't last long in my house. The best part is, it's all made in one pot! If you are lucky, you can find butternut squash already cut up. Otherwise, buy a whole butternut squash, peel and seed it. to add a nice rich roasted flavor to the soup. Add half of the chicken broth and let everything simmer and soften together. 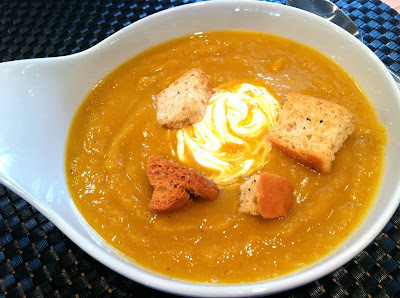 Use one of my favorite kitchen tools, an immersion blender to puree the soup. I like to leave a little texture but it's all up to you. Add the remaining chicken broth and adjust seasoning to your liking. I like to use 32 ounces, use more if you like a thinner soup. 2 teaspoons of curry powder, or more! In a large dutch oven, heat oil over medium heat. 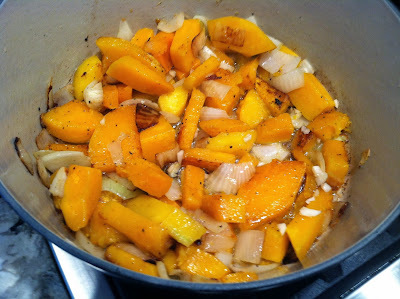 Add onions, squash, garlic and saute until slightly brown, about 5-8 minutes. Add curry powder, nutmeg, salt, and pepper and continue to saute for 2-3 minutes. Add 2 cups of chicken broth and bring to a boil. Reduce heat and simmer for about 15 minutes and squash is nice and tender. Turn heat off and puree with an immersion blender until smooth. Turn the heat back on low and add the remainder of chicken broth and bring the temperature back up. Add more curry for a little more spice if you like! Ladle into bowls and garnish with sour cream and croutons if you like! Linda, trying this today. I'll let you know what I think.